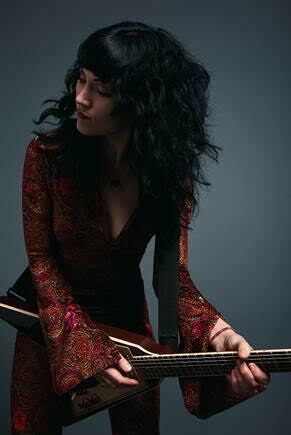 Purson, the psychedelic rock act led by vocalist, guitarist & prime creative force Rosalie Cunningham, have taken a bold step into the world of fashion by joining forces with Mr Fish - the iconic British fashion brand whose clothes were worn by David Bowie, The Rolling Stones & Jimi Hendrix. Starting in 1966, Michael Fish forged his reputation by crafting clothes for celebrities, musical and otherwise, including Muhammad Ali, Princess Margaret & Pablo Picasso (! ); the business closed in 1974 after a fire consumed the premises, but now the legendary Mr Fish name is back, and Purson are right at the heart of the re-launch – their retro influences and colourful persona, as displayed on latest studio album ‘Desire’s Magic Theatre’, making them the made-in-heaven muse for the latest Mr Fish creations. Indeed, both Cunningham and keyboard player Samuel Robinson have designed their own outfits – including cat-suits plus a pure silk man-dress – in close consultation with British design specialist David Mason, who has revived the Mr Fish name out of 34 Montagu Square, London: a blue-plaque location, dubbed ‘the secret Abbey Road’, that was once home to Jimi Hendrix, as well as Ringo Starr, Paul McCartney (who wrote ‘Eleanor Rigby’ there), John Lennon & Yoko Ono. Meanwhile, July 22ndwill see the release of a new version of the ‘Desire’s Magic Theatre’ album, Purson’s debut outing for Spinefarm Records. Having originally been issued on black vinyl, the LP – drawing inspiration from the rock operas of the late sixties & early seventies – will now be available on ‘Naked Blue’ vinyl for a limited period. Having toured the US with Ghost & The Sword, played the UK’s prestigious Download festival and become the proud recipient of the ‘Vanguard Award’ at the Progressive Music Awards (2015), Purson is quickly establishing itself as a growing force on the international music scene. Just recently, the band received an ‘Album Of 2016’ nomination from Prog magazine, whilst broader media awareness continues to be strong, with support from 6 Music right across the board. In support of these shows, Purson will release a new video for ‘Electric Landlady’, a track from ‘Desire’s Magic Theatre’ that, according to Cunningham, is “essentially about Mother Earth, of feeling at home in the world, safe and loved, with some tongue-in-cheek lyrics”.